Footprints on the sands of time;"
No one has left bigger footprints in the sand than the ancient Egyptians. With relatively narrow bands of arable land bordering the the Nile, they built most of their great monuments in the desert. Reading Nighthawk's interview of Khasekh from Asenath (by Anna Patricio, Imajin Books) reminded me of one of the most memorable of our family trips.When I was eighteen, we took a cruise down the Nile. By "we" I mean my mother, father, sister, four cousins, aunt, uncle and Nana. The eleven of us made up about a third of the passengers on the boat. Maybe a half. It wasn't a big boat. We flew to Aswan and cruised north to Cairo. It was the most amazing trip I almost didn't take. Foolishly, I considered staying home alone so I could assert my independence. Yeesh! Talk about young and foolish. I changed my mind - just in time - and got to assert my independence by sharing a cabin with a forty-something divorcee named Ursula. After the onboard Egyptologist lectured us on the temples and monuments we would be visiting, Ursula lectured me on the importance of moisturizers and what OLAY meant. If you've ever watched The Mummy (1999), our boat looked exactly like the one they travelled on, minus the horses. All the places they visit in the Mummy Returns (2001) - excepting the oasis with the diamond topped pyramid - we visited. Watching the movies is like home movies with an adventure thrown in. When I'm old and senile, I'll probably tell my grandkids how I collected sand from Hamunaptra - The City of the Dead. 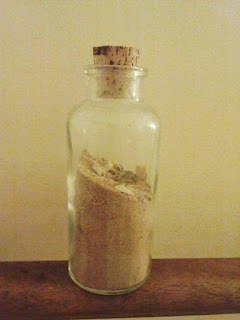 In fact, I'm not sure where in Egypt I scooped up the sand that resides in the bottle above. It might have been after our camel ride. I would have been very appreciative of sand beneath my feet by then. *gasp* you never told me you went to Egypt! AWESOME!!! I was only in egypt for 2 days in my recent middle eastern trip, as the focus of the itinerary was Israel.... BUT we def plan to return to Egypt and have that Nile cruise! My daughter went to Egypt last year and spent a week or two there, did all the touristy things, rode a camel, got sunburned, photo in front of pyramids, etc. etc. I wanted to be there in absentia and sent her annoying Tweets to that effect. It was good timing as I imagine Egypt's tourist industry has suffered greatly this year. Alison, you are an interesting person. No wonder you write so well. How fabulous, Alison. Egypt is on my wish list and I do hope to get there one day. Sounds like Anna managed to capture it well and you've been able to take a second trip! Sharon, you won't believe how excited I was when heard Imajin Books was publishing a book set in ancient Egypt. Kenna, if you ever get the opportunity to go to Egypt, and there isn't imminent danger there, GO! I only hope I get to take my kids there someday. When you go, you and Anna will have to send me pics. All our photos were taken as slides and lost in one of my parents' moves. Yes, I know that second lat sentence makes it sound like Kenna and Anna will be travelling together. I haven't had my coffee yet. Egypt? Sign me up, beam me up... I don't care, just let me go to Egypt. What an awesome and enriching experience to have, Alison. Clearly, you weren't too young and foolish to appreciate its value, as you remember the trip and still have a treasured memento.